Well, my parents had a garage sale this weekend and it was actually fun. My dad and mom do a good job at being friendly and talking with the people. The garage sales that I've been to, no one talks to you. On Sunday we went to Hosana Asamblea in Bellevue, Washington with Pastor Rafael Gradilla. We had a great time! The church is thriving, worship was moving, and the people are very friendly. We shared about the ministry in Cofradia and prayed for people at the end. A family from Cofradia came to the service which was really neat to be able to have them share a little as well. Everardo and Rosa who are the Restaurant owners just down the street from the mission base brought their whole family with them; Dan and Nadia with Jane and Daniela, Heidy with Stephanie, and Manuel, Jr. It was so good to see them again. We went out to Heidy's house in Shoreline afterwards to have some Pozole (a mexican soup made out of pig head), and hung out for a while. 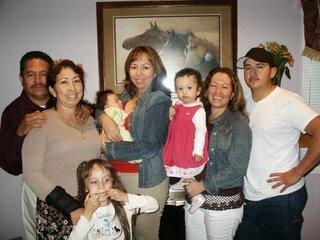 Everardo, Rosa, Jane, Rosa Daniela, Nadia, Stephanie, Heidy, and Omar (Heidy's husband). Not pictured were Dan and Manuel who had to leave before we took the picture.